T'nalak Festival is a South Cotabato week-long, annual celebration that aims to showcase the region's vibrant spirit, unique culture and multi-ethnicity through street dancing, traditional hut contests, beauty pageants and other activities. T'nalak is a word which refers to the intricate fabric of T'boli, a group of indigenous people in the area. The celebration, however, doesn't only concentrate on the said tapestry. It encompasses the way of life of South Cotabatenos, a group which roughly consists of 5% Muslims, 15% indigenous people, and 70% Christians. Our Byaheng Mindanaw group participated in the 15th T'nalak Festival last July 18. We started our morning witnessing the thematic street dancing competition. The event was divided into three categories: Madal Be' Lan for pure T'boli contingents demonstrating tribal dances, Kadsagayan A' Lalan for the colorful dances of the Maguindanaoan tribe, and Kasadyahan sa Kapatagan for the Christians exhibiting bountiful harvest. As I watched the parade, I observed that there are different main dancers in each category. The T'boli group flaunted a couple using a malong (sometimes a bolo knife for the male) as a dance prop. The Maguidnaoan (or Muslim) group showcased their high regard for their prince and princess who in a couple of contingents were sitting in a small open hut carried by other participants. The Christian group' star dancers are ladies carrying a statue of the Virgin Mary. The difference has proven one thing - the culture in the province (or the entire Mindanao) is rich in colors and traditions. I'm quite sure there are stories or practices beyond what we have seen, and I truly hope that one day, all Filipinos would understand and appreciate them all. Our group was fortunate to be invited to the luncheon at the city gym. The food was superb, but what caught our attention is the huge fresh tuna cut in slices for sashimi. Dan ate plenty (not in the picture)! The visitors enjoyed their meal while being serenaded by local performers. One of those who sang was Kobe Viray, a contender for The Voice Kids under Lea Salonga's team. What a cute, talented and humble kid. We also had a chance to see the pageant finalists in their T'nalak dresses. We should have requested them to stand and remove their sashes so the picture would say the designers did a splendid job. Their dresses uniquely represent the city. The details include rice grains and beads. Our group also joined the launching of tour packages to the 12th Paradise. 12 stands for Region 12 (also known as SOCCSKSARGEN), which comprises the provinces of Sultan Kudarat, South Cotabato, North Cotabato, Sarangani, and the cities of General Santos, Tacurong, Koronadal, Cotabato, and Kidapawan. 12th Paradise is the region's new tourism brand. The organizers combined dances, narration and presentations to feature each tour package, making the program interesting for the audience. The region seems to be doubling its effort to promote tourist spots and training local guides in the area. This, I believe, is an excellent strategy because Region 12 has a lot to offer. Whether you are into bird watching, wildlife discovery, mountain trekking, beach bumming, or cultural immersion, SOCCSKSARGEN has definitely something for you. We also checked the thatched huts distinctly representing a city or community in South Cotabato. The huts are decorated with fresh produce, local products, and other locally-sourced materials by local artisans and craftsmen. Tupi, for instance, accessorized their hut's entrance with a big tarsier, a primate discovered in the municipality a few years back. The huts also sell South Cotabato products such as brass bracelets, bead accessories, T'boli costume, etc. Videoke - What a Way to End the Day! 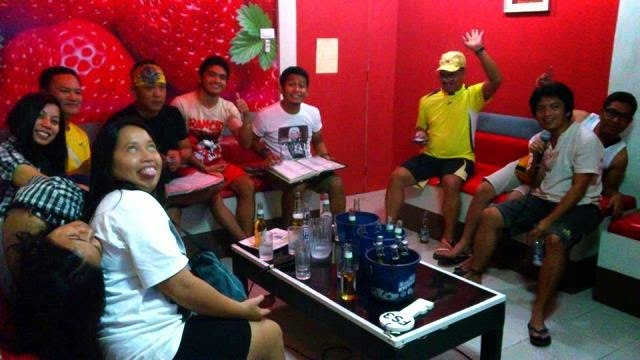 We capped the day singing our hearts out at a videoke bar. I don't know how to describe that night. The word "epic" seems to be an understatement every time I'm with my Byaheng Mindanaw family. Planning to go to Koronadal City for the T'nalak Festival next year? From Davao City, take the bus to Koronadal City at Ecoland bus terminal. The other option is to take the bus bound for General Santos City and then take a van or another bus to Koronadal. Make sure you visit T'nalak Festival's website or follow T'nalak Festival's Facebook page for updates. Reliving the Tnalak days with Byaheng Mindanaw team! Good one, kitkit.